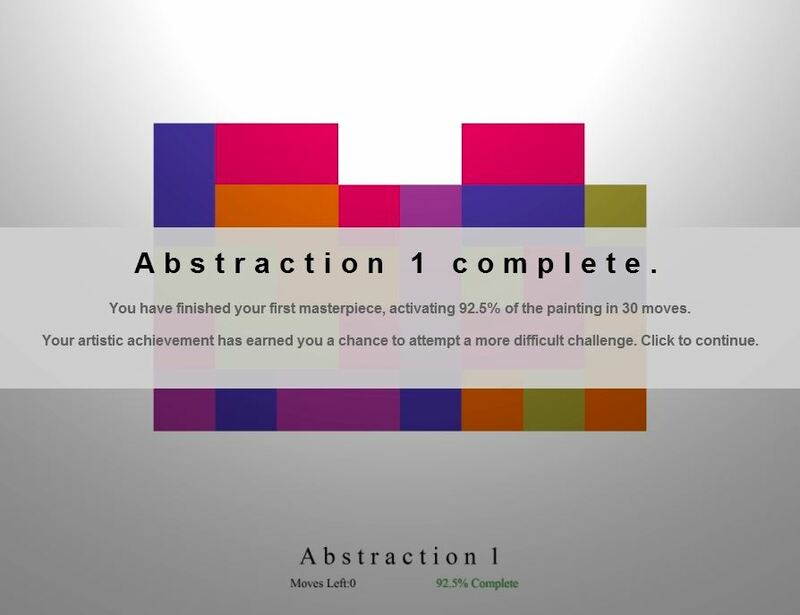 Did you know that all you need to create art, is the ability to paint colored blocks? Well, abstract art anyway, which can then be turned into a video game of sorts… given the right amount of imagination. Inspired by the works of American painter, Ellsworth Kelly, this particular puzzler will have you doing some serious color matching, to craft – believe it or not – a proper masterpiece! Ever since Ludum Dare 26, which is where Ellsworth (the game, not the artist) originated, I’ve taken quite the fancy to minimalistic games/gaming. There’s just something intriguing about the whole “sometimes less is more”. Obviously, the entire thing can all too easily backfire, if the outcome ends up too basic and/or generic, bordering on overly simplistic and, well, boring. Fortunately for fans of color-based brain-teasers, that’s not the case here. 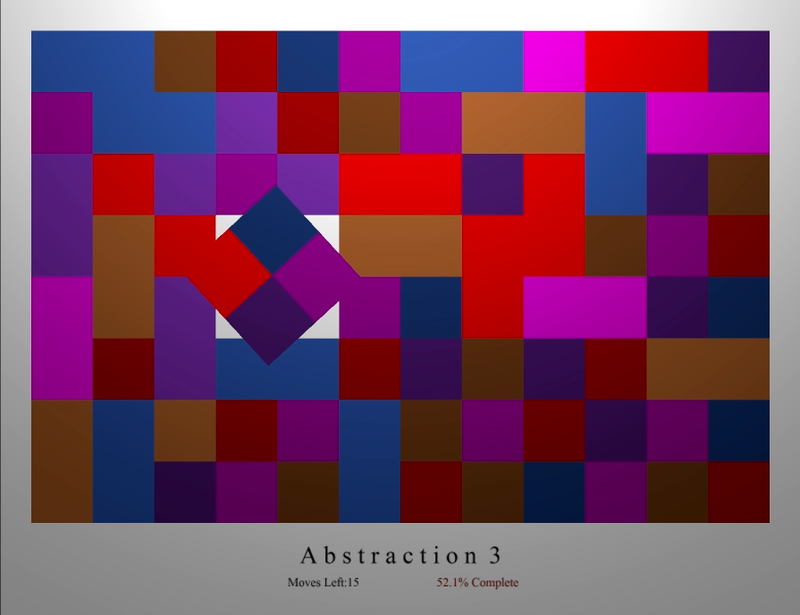 In each Abstraction (read: level), you’re given a limited amount of moves to ‘solve’ a puzzle consisting of randomly generated colored blocks. Matching colors by rotating them changes their appearance to a brighter variation, letting you move onto another part of the painting instead. It may sound simple, but believe me, it isn’t. Not once you go beyond the first level, anyway, and even less so, since rotation can only be performed clockwise. This means you’ll want to make sure a move is worthwhile, before committing to it. Things start out simple enough, with a 8×5 playing field. But with each finished Abstraction, the area expands with more blocks, increasing the challenge at a rapid pace. And once you get to #3, which is where I had to call it quits, the once easy 90% requirement becomes nigh impossible without some serious planning ahead. Also, once you fail a level, it’s back to the beginning. That, coupled with a complete lack of audio, are the only two genuine downsides to an otherwise polished and unique puzzler, however. Those interested in trying their luck as an (abstract) artist, would do well to fire up either Chrome or a recent version of Firefox, and play the Ludum Dare 26 entry, Ellsworth.